Seems this is becoming a thing now (which is absolutely awesome as far as I'm concerned) so here's my project. I've mentioned it a few times before but work is well and truly under way now with hopes that it will be standing on its own wheels and engine fired by October (although) still a long way from finished. 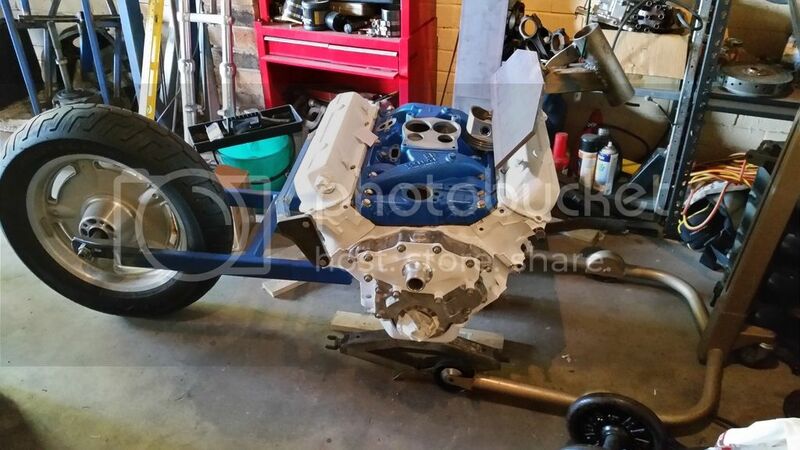 This is basically the bits of the frame that are part way done mocked up on the motor. The frame is entirely modular so the front and rear sections don't meet, but rely on the block and heads to form the central frame member. 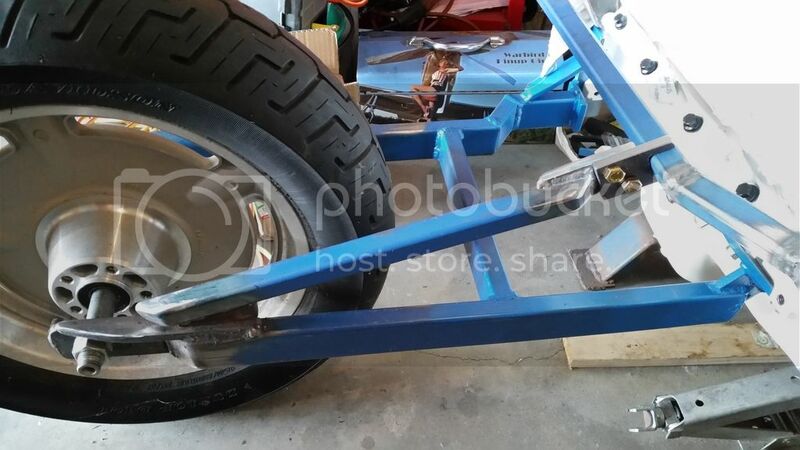 In addition to what you see there will be diagonals added from the rear axle plates up to the horizontal bar on the rear head, and the front section will have brackets attaching that big plate to the sides of the front head while tubes run down to the engine mounts on the block. Wheels and front end are harley sportster and the engine is a mild rebuild on a holden 253, now measuring 261ci with a little cam and gently massaged heads. I have a quartermaster 7 1/4" clutch which will run on a two piece jackshaft behind the motor providing direct drive (no gearbox) to the rear wheel. I'd love to say it will be ready for 2018 but I'm thinking 2019 at the absolute earliest. Fantastic! Absolutely agree, will be great fun to see a load of them out there. Looking forward to seeing your clutch too. Cheers, love the white motor by the way. Thanks to a change in job work on the bike has been a little slow lately but it is moving. Fortunately said job has also grown the racing budget slightly so it's not all bad. Part of this build involves learning to cast my own parts as there's some kinda odd stuff I need and I like learning new skills. I made my first attempt yesterday firing up my home made furnace and attempting to melt a piston but sadly all did not go to plan. No matter what I threw at it I just couldn't get the little bugger to melt. I was being cautious and adding fuel slowly (bbq charcoal) so as to sneak up on the required temperature but I think this lead to a lot of energy wastage meaning it just never got as hot as it needs to be. Love to see some pics of your furnace setup, casting is cool! Also keen to see how the frame developes. Cheers! Image works fine. Full page. Has it got your whole image in. Yes, looks great. I'm also keen to hear it running! Momec3 yep the image is just the back section. The block is around 55cm plus all the odds and ends that hang off the front. I'm not sure that it is shorter than an LS but it's amazing how small they start to look once you bolt all the motorcycle stuff to them. When you think about bikes like the CBX1100 or Z1300 it's amazing just how much motor can disappear into the machine. 55cm? Interesting, the LS3 is 520mm across the block (measured just below the head) plus the water pump etc that hangs off the front; the intake for the fuel injection sticks out a bit there too. Yeah, my mate Paul's Blackbird is 600mm across the fairing at it's widest point ... I did think for a second about stuffing it into that for a surprise! I'm thinking my radiator will be out the back and probably in line with the direction of travel ... will you mount yours in front? E.J. Potter's bikes look so good without radiators ... I guess that's the advantage of drag bikes aye. Radiator's a tricky one. I've had a few ideas including 2 small ones either side of the back wheel or somewhere in the tail piece. I'm leaning towards using an EK civic unit as they're small and thin and sticking it right in front of the motor but I'm still not 100% about that. 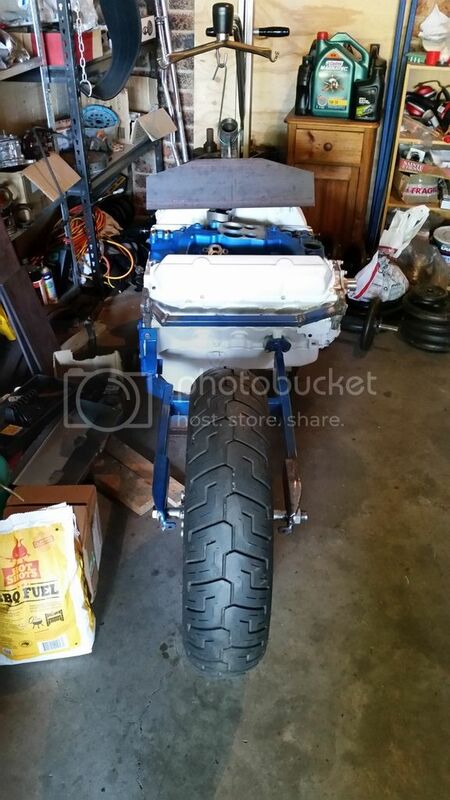 I will also have an oil cooler in front as I need to move the oil filter from the stock location. It sticks WAY too far out the right side and will touch down pretty easy which is bad news. I'm set on APS bodywork which should give me some real estate to stuff things into but I want to make sure it is at least has the capacity to run naked as well. I have a bit more space out the back with my setup so I'll have one large rad in the gap between the rear of the motor and the rear wheel; probably overlapping the rear wheel a bit too. Same, re APS and Naked. Ordered my clutch today, also same as yours, thanks for the advice! I also ordered some bits of 1045 steel so I can start making my transmission shaft and sprocket adapters. I kept the lower portion of the rear of the frame which comprises the "fork" structure for the rear wheel and the rear engine mounts. The two diagonals now come up higher to reach over the rear rocker cover and a large backbone made from 75x50x3 RHS which tapers down to 50x50 at the rear has been added. The front engine mount which is yet to be fabricated will consist of a plate which sandwiches under the exhaust header flange, with holes in it to allow the exhaust gas to go on its merry way. The new design is a lot simpler which to my mind provides less potential failure points and also eliminates a potential issue with the large plate on the front creating aerodynamic lift on the previous design. It never ran so who knows if it would actually have been a problem but looking at it gave me the creeps. This shows the newest incarnation of the frame with the tapered backbone bolted to a plate on the rear section. This was made by taking a piece of 75x50x3 rhs, taking a pie cut out of both sides before folding the bottom in and welding it all up. The opening at the back with be closed up and the sharp corner at the top taken off it. Its made from two peices of 6mm plate welded together in the centre such that they make a slight V where they meet. The idea is there is no way this piece can bend without being forced into a compound curve, thereby providing enormous stiffness without taking up too much space. That's the theory anyway. It will be welded to the top of the exhaust header flange which has been cut from 8mm mild steel plate.